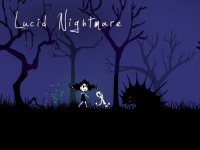 A little girl named Lillian is experiencing an unpleasant happening of haunting nightmare nearly every night lately. She is always overshadowed by creepy dark creatures who always follow her in her dreams. But she is helped by the existence of a white octopus who always accompanies her wherever she goes. The octopus can be useful as a weapon when the dark creature with red eyes appears and get closer to her. By pressing the J button the octopus will spin around and protect Lillian from danger. Lillian also needs to collect fireflies that come in useful as light surrounding her every step. Use a paddle and bounce the ball to hit all bricks floating on the screen. A remake of the classic Super Mario Bros game.